It seems that I get creative/artistic at the end of December and in early January. 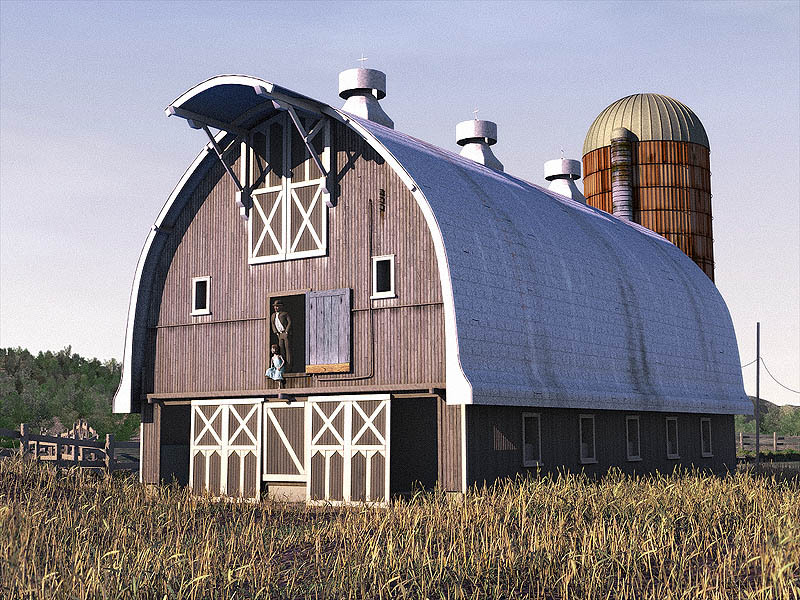 This year, I was inspired by a picture in a book about barns that presents!Joy got me two years ago. I really enjoy looking at barns, especially ones that have begun to collapse. It probably has something to do with being able to see the naked structural elements of something whose whole form is so commonly visible. Also, barn interiors give you a great sense of positive space, with lots of particulate matter floating around and scattering the sunlight that streams in through the imperfectly finished walls and roof. The barn in the picture below is in rather good shape, so apparently none of the reasons above apply. I liked it anyway, and decided to use it as a basis for this year's piece of art. So, after probably about 15-20 hours of work, I put this together. The title is Sunday Morning. Probably tomorrow, I'll be making a couple of decent sized prints of this on our super-slick Indigo digital press at work. Suitable for framing? Not so much, but it's fun to see it on paper.